Using the height in your storage facility is one of the best ways to maximise the space available to you. 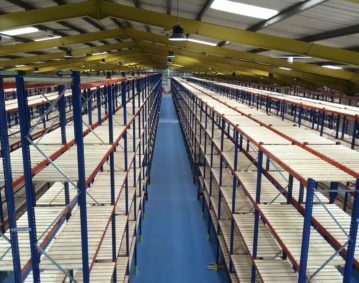 Mezzanine flooring allows you to do just that, acting as a cost effective and efficient solution for your warehouse. This blog will go into more detail about the options available to you when installing mezzanine flooring and a general overview of the process involved. There are a number of different design variations for mezzanine floors, each one constructed to being the most out of your work environment. One thing they do all have in common is a well thought out design that has been made in accordance with CE marking. This means the construction meets the essential regulations of the relevant European health, safety and environmental protection legislation. Businesses are responsible for the health and safety of their employees. If their regular daily duties involve working on or around the mezzanine floor then any potential risks or hazards have to be fully considered before installation. One such measure would be the installation of protective handrails to ensure staff working at height are prevented from falling and injuring themselves. This also applies to any equipment that may be used on the mezzanine, stopping it from going over the edge and becoming damaged or potentially injuring someone. Mesh panels are an alternative which will also serve to prevent small work items from going over the sides. Adjustments made to mezzanine flooring aren’t only carried out for safety concerns. It could also simply be to create more of a visual impact in the space if brand image is of importance. For example, staircases, handrails and pallet gates could be branded using the company colours. These would be powder coated to ensure there is a high level of corrosion resistance. There are three different types of pallet gates to choose from – the fail-safe roll-over, a light weight design or a swing gate. These help to protect staff members from open areas, such as the loading of pallets. Once installed, pallet gates are extremely durable and require very little ongoing maintenance. There are a number of different options available when it comes to choosing the flooring material. However, to help narrow it down, below are the three most popular types that are suitable for the vast majority of environments. This is a high density board that can also include additional moisture resistance, wear resistance and non-slip features if required. If there are a lot of spills or leaks in the building then moisture resistance could be a good option. The textured patterns of this style provide extra grip and it copes well with heavier loads. It is a hot-rolled structural steel floor plate and is characterised by a raised, even pattern. Forge-wielded gratings are often used as the preferred choice for areas such as gangways, plant platforms and transfer aisles. The maximum size of a mezzanine floor should be 200m² if you do not wish to apply for planning permission. This also means that any planned alterations must take place solely within the building. However, building regulations will have to be met. This will come down to the supplier to ensure it meets the required standards on areas such as fire escapes, fire protection, disabled access and more. Fire safety is a big concern when installing a mezzanine floor. It should be constructed so it slows the spread of fire while maintaining the structural integrity of the building so staff members can evacuate. The supplier will have to provide a range of methods to ensure early warning of fire can be raised and that it can also be prevented and slowed down. Once site surveys and inspections have finished, a qualified surveyor will review the site to understand the full requirements. From there, accurate quotations can be produced, along with production schedules, CAD drawings, manufacturing drawings, materials procurement and an installation schedule. After building regulation requirements have been checked and cleared, work on the project can begin. The manufactured parts will be delivered to the site once ready so the installation team can start constructing the mezzanine floor.